Book a private tour at a time that suits you! Experience a journey through time as we explore the medieval architecture and winding lanes and “bow-ways” of the town while revealing the characters and stories that have shaped its past. Rich historical sources are used to illuminate the lives and experiences of the ordinary poor of Ennis as well as the rich and powerful leaders that shaped our destiny. This acclaimed tour provides a highly entertaining and thought-provoking experience of the charming town of Ennis. These private tours are run at a time that suits you. Private tours can be arranged for a weekday or weekend, day or evening. Please contact Jane at +353 (0) 87 648 3714 to arrange a tour. Tours normally take approx. 75 minutes but this can be adjusted to suit your schedule. We walk approx. one mile at a moderate walking pace, stopping at various points along the tour. The guide can arrange to meet you at your accommodation in town or from outside the Ennis Tourist Office which is just off the main square in the centre of the town. The tour consists of approx. 10 stops and will take in all the major sights of the town of Ennis including the O’Connell Monument, the old bow-ways, Old Abbey, 1916 memorial, Franciscan Friary, McParland Building, Chapel Lane church, the Market, St Peter and Pauls Cathedral and much of the towns art and sculpture trail. Particular requests or customisation of the tour can also be accommodated on the private tour. Ennis Walking Tours generally presents tours rain or shine. There is a minimum charge of €80 for a private tour of up to 4 people with an additional charge of €20 per person after that. For larger groups please contact Ennis Walking Tours directly for larger group rates. Tours are run by the owner/operator of Ennis Walking Tours, Jane O’Brien. 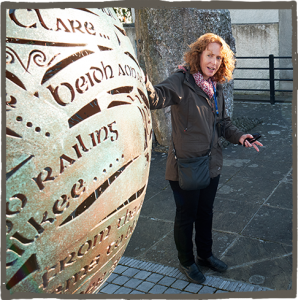 An expert guide with a Masters in local history and a History PhD underway she has been running tours of Ennis since 2005 but it is also Janes storytelling skills that bring the vibrant past of the town alive for all who join her tours. Read more on your guide. For medium to large sized groups the guide uses a small microphone amplifier to ensure that all the group can hear clearly. Also all stopping points have plenty of room for the group to gather. The tour is wheelchair accessible – the route is mainly on flat ground with kerbstone dips available along the route. Full refunds are available by request up until 24 hours prior to a walking tour. Cancellations with less than 24 hours prior to the tour or no shows will not be refunded.